Can it be true that, in terms of size and production, the brick industry in the Hudson Valley was second of importance in our region to IBM? So George H. Hutton told us in his book The Great Hudson River Brick Industry. We can quibble with his hyperbole, but the truth is that in its day, the brick industry was a force with which to be reckoned. In Haverstraw alone, 2,500 people worked in the industry, a disparate band of migrants, children, immigrants and slaves, which supported more than 10,000 families. Even harder to believe is that all that’s left of this thriving industry is its history, which will be retold in an exhibition at ArtsWestchester: Brick by Brick: The Erie Canal and The Building Boom. Brick is one of the oldest of building materials, dating back to 7,500 B.C. What made the Hudson Valley, particularly Croton Point, so fertile for brickmaking was the rich blue clay deposits that perhaps resulted from rocks being crushed during the Ice Age and settling in the Hudson River area. The success of the brick industry was in part due to the alignment of several things: the rich blue clay, of course, was one of them. The mid-century opening of the Erie Canal was another. It facilitated transport of heavy goods, up and down the river. Then, there were the terrible loft fires in New York City, which created a need for replenished building materials that, in some years, accounted for a billion bricks annually. Complicating the City’s problems was a burgeoning immigration rush, a cholera epidemic and a dire need for a fresh water source (ultimately provided by the Croton Aqueduct). And then, there was the VerValen machine, invented in Haverstraw in 1852, revolutionizing the brick making process. There was a sad ending to this mighty industry. Glass, aluminum, concrete and imported bricks heightened the competitiveness of the market. Careless excavation caused a landslide and disaster for the village of Haverstraw. Still…there are folks who remember this era with the nostalgic occupation of collecting and trading bricks. There are descendants of the families that worked in the brickyards who remember how good and how bad it was. 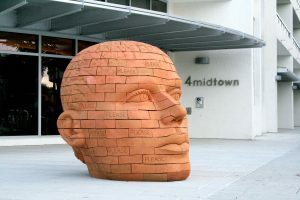 There are artists who use brick as their sculpture material. There is Peter, a civil engineer, who teaches kids about brick in Westchester classrooms. There’s the BrickLayers Union, which keeps the trade alive. There are historic brick buildings, like the former bank restored by ArtsWestchester. All of these remind us of the aesthetic importance of signature brick architecture. Then, of course, there’s a chuckle for the faux brick…LEGOs. And yes, there’s also a story to be told, and ArtsWestchester is proud to be telling it. Brick by Brick opens on October 2 and remains on view through January 19, 2019. For info, visit artsw.org/brickbybrick and follow #AWbricks.